Use this exquisite comb to smooth out coarse and thick hair. Handcrafted, its teeth are expertly carved and refined to help detangle and style hair. 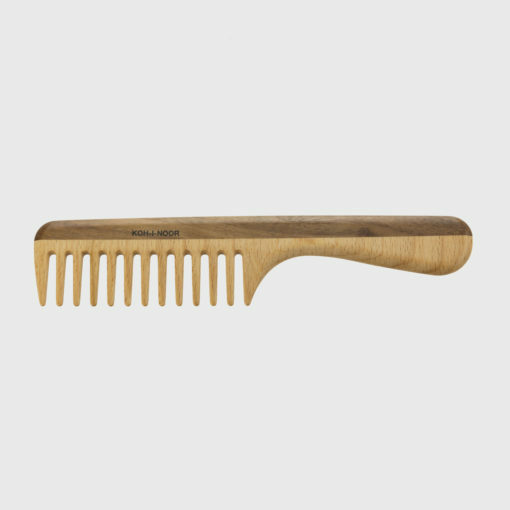 Always gentle, this comb is durable and will keep your hair looking its best. Care: Remove any excess hair from your comb and spritz a bit of water from a spray bottle instead of soaking. Tilt your comb standing up on a clean towel, tooth-side down, and leave undisturbed until dry. Made of beautiful beech and Kotibe wood, this artfully designed comb is lightweight, durable and comes with a gold stamped logo (TBD) on the handle. Naturally coarse hair can be hard to work with but this comb is my new best friend. It’s great at helping me get a nice choppy and piecey look and I need far lessy styling product on it.